Months before taking over the interim role at Manchester United, Ole Gunnar Solskjaer had publicly stated that the team at Old Trafford needed to be built around the club’s record signing, Paul Pogba. And since his arrival in December, the Norwegian tactician has done just that, and its benefits are there for all to see. The France international has simply thrived from the freedom he has received under the new gaffer, as he has so far been directly involved in 8 goals in just 5 appearances. 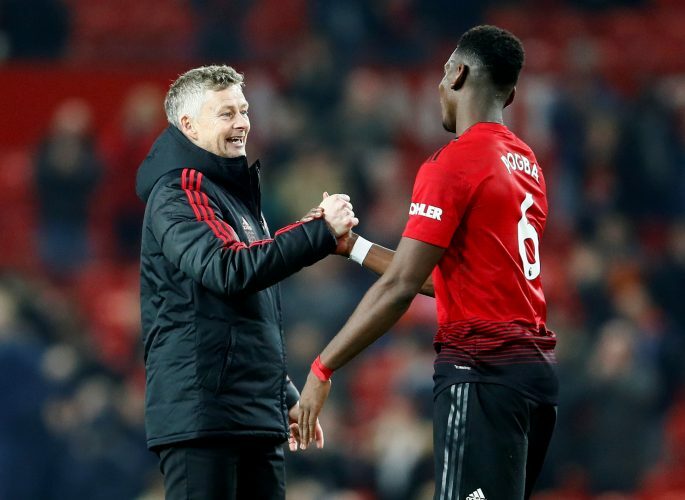 Further, Solskjaer hasn’t been secretive of the importance he has given to Pogba’s role in the current United side either, if latest report from The Sun is to be believed. The English outlet reveals that Ole has directly told the entire Manchester United squad that the 2018 World Cup winner is his main man, and that the team will strictly revolve around the dynamic midfielder. Solskjaer also conducted a one-on-one meeting with the 25-year-old, assuring him that he had full freedom on the pitch, thereby boosting his morale in the process. The Red Devils’ legendary striker rates Pogba as the best midfielder in the Premier League, and judging from the manner in which the Frenchman has functioned in recent weeks, not many will argue with the assessment. Moreover, it seems the players are also happy to play in a setup that functions around Pogba, and are themselves willing to aid the talisman do his thing on the pitch. Ander Herrera reflected the same after his side’s win over Newcastle, when he stated: “He (Pogba) is very important for the club – (on) the pitch and out of the pitch as well.